Samsung has recently launched an open-standards data exchange platform for IoT called SAMI. Your devices and sensors – of any type, style or vendor – push their data to the cloud, where SAMI collects and standardizes it, then makes it available through web APIs. SAMI data platform lets you focus on innovative services and applications while taking care of the low-level protocol mismatch. SmartThings Open Cloud, a new open software and data exchange cloud offering for IoT built on top of SAMI opens up an immense amount of new opportunity for innovation and accelerated growth across the IoT ecosystem. This greatly expands and enhances the amount of devices, services, and user experiences available. Oracle on the other hand offers one of the most comprehensive CX portfolio on the Cloud esp. for consumer electronics and home appliances industry in the shape of Oracle Service Cloud and Field Service Cloud CRM. Ephlux ‘consumer electronics and home appliances’ solution built right on top of Oracle Service Cloud expedites the returns with the shortest time-to-market, lowest cost and implementation risk path. Now, Ephlux is building a solution which leverages Samsung IoT Cloud with Oracle RightNow Service Cloud to provide your smart products the power to report their operational data and warning alerts much before the customer picks up the phone to report a faulty home appliance. How about your smart products self-registering themselves, self-servicing and scheduling maintenance appointments proactively based on the warranty status – a stitch in time saves nine and definitely makes your customer happy! How about a loyalty program in which the smart devices participate directly and earn service points for their good behavior i.e. complying with the recommended operational thresholds. Samsung & Oracle | Ephlux is here to connect the two giants! 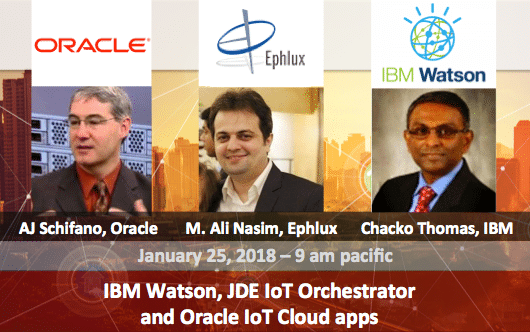 By leveraging on the innovation and scale of the two giants Samsung and Oracle in their respective areas of expertise, Ephlux is positioning itself to be the “Customer Experience Integrator of Choice” between the Samsung IoT Cloud and Oracle CX Cloud apps. To learn more about this exciting initiative at Ephlux, feel free to reach out below to be part of this amazing project.